I thought I would try the same style for reviewing the Sakura Pigma Micron as I did with the Parker Urban. I would love to see your comments on this new style I am using. This is very much a standard plastic barrel. The cap has a pretty strong metal clip and what I find most impressive is the cap really clicks strongly into place when it is either posted on the top or bottom. As much as I have have said this is a standard plastic pen it doesn’t look like it thanks to the colour of the barrel and cap. It is a dark cream colour with the text colours used both black and purple. To keep a flow to the colours the bottom of the Micron were you would post the cap is black. There is a ring of plastic that protrudes from the bottom of the grip area. This is really important as I found the grip area to be way to smooth for me to keep a good grip of the Micron while writing for long periods. I also found the grip area to be usually small. Things get interesting here, I find the cap really unbalances the weight of the Micron. The cap has a metal clip and is connected to the cap using a pretty wide metal ring at the top. This makes the cap very top heavy. With the cap posted the Pigma feels very bottom heavy. For the best writing/sketching experience don’t post the cap. Felt like I was using a completely different pen with and without the cap posted. With the cap it comes in at 13.5cm in length. Without the cap it is 12.9cm in length. With the cap posted it is 16cm in length. There isn’t one. Just buy a new one when the ink is all gone.....NEXT!! The nib is covered with a metal tip and if I can give some advise here, don’t be heavy handed when writing as it would be very easy to damage the super tiny writing nib. I nearly bent the nib when I first started writing! 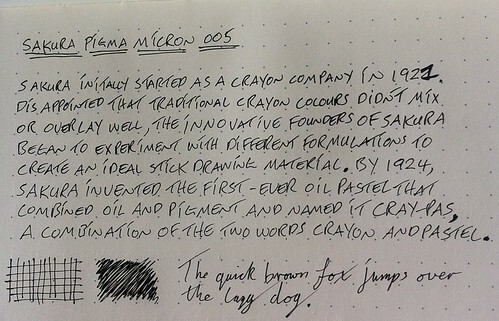 The Micron I have been using is the 005 model (Black) which writes with a 0.20mm line width (Heres a link to the other line widths it comes in). 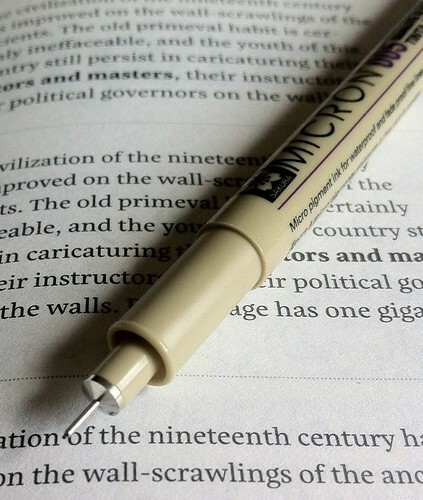 The ink used is of archival quality which means it is waterproof and fade resistant. I found the ink flow to be super consistent and has great depth of colour. It didn’t bleed, feather or smear on any of the note/sketch books I have been using. One pretty cool thing is that I haven’t seen anything show through to the other side of the paper. You can also buy it in the following colours; Black, Red, Blue, Green, Brown, Orange, Purple and Rose (Would love to try this one!). Mine cost me £2.32 from Cult-Pens and I think it is well worth it. Even though I think its target audience is professionals and artists it is a great everyday pen for anyone. I definitely will continue to buy this and really recommend you try one. Just don’t write with the cap posted!